Each Ipadox capsule contains Doxycycline Hydrochloride BP equivalent to Doxycycline 100 mg.
Doxycycline is a semisynthetic derivative of oxytetracycline. 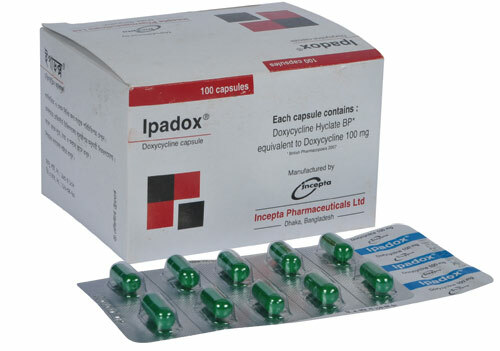 Ipadox (Doxycycline) is a broad spectrum antibiotic with the broadest spectrum of any known antibacterial agent. It is active against a wide range of gram-positive and gram-negative bacteria, spirochetes, mycoplasma, rickettsiea etc. It can be used with success in place of penicillin in the treatment of gonorrhoea and syphilis. Ipadox has an excellent mode of absorption and is almost completely absorbed (95%) from the GIT. Food does not interfere with the absorption of doxycycline, 90% of the drug in circulation is bound to plasma protein. Biological half-life varies between 16- 23 hours on repeated doses. Due to its higher lipid solubility than any other tetracycline ,doxycycline attains a wide distribution in body tissues and body fluids. Adults: 2 Ipadox capsules at a time or one capsule every 12 hour for the first day followed by 1 capsule per day. The dose may be doubled depending on the severity of the infection. Gonococcal infection: 1 Ipadox capsule every 12 hours until complete recovery. Syphilis: 3 Ipadox capsules in divided doses for 10 days. As with all other antibiotics, side effects liable to be encountered include: Gastrointestinal disterbances,eg. anorexia, vomiting, dysentry etc. overgrowth of resistant organisms may cause Glossitis, Stomatitis, or Staphylococcal enterocolitis; Apart from these skin rashes, purpura may occur. Photosensitivity and dermatological reactions are rare. Alkali, antacids or irons should not be taken along with Doxycycline. Because these may reduce the absorption of the drug. This drug should not be administered to pregnant woman. But in emergency cases it may be administered upon the advice of the doctor.